HTC is known as a powerhouse manufacturer here in the US, but consumers will finally see what the high-profiled company can do outside of their comfort zone in the smartphone market. Starting today, AT&T is selling the HTC Freestyle for the 2-year contract price of $99.99. At a cursory glance, some will probably mistake the handset for yet another smartphone from their arsenal, but after meticulously looking it over, one will soon realize something completely different. 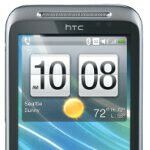 Naturally, the HTC Freestyle is a BREW based feature phone that brings along HTC’s well recognized Sense user interface. Some of the other features include a 3.2” capacitive touchscreen with a resolution of 320 x 480, 3.2-megapixel camera, Bluetooth 2.0 with EDR, 150MB of internal storage, and 3G connectivity. Although the HTC Freestyle might be shaping up to be a respectable offering in the feature phone market, its pricing when compared to other new handsets, like the $99.99 on-contract HTC Inspire 4G, might turn off some people. how do you turn off this phone. i ust got it and i adoe it great phone nothingswrong with it nearly perfect but i have no idea how to turn it off..?